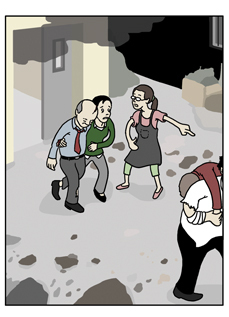 You can click on this panel if you’d like to read “The Heroes,” my comic for the BZ’s 10th anniversary issue of 9/11. This was the freelance project I was plugging away at for most of last week. Thanks again to everyone who picked up the issue or checked out the comic online. Thanks as well for all the kind words of congrats for having the piece published! Mazel Tov! It’s really a fantastic piece of work – loved reading it.